Game Wario Land: Shake It! Glittertown is a bright and flashy level in Wario Land: Shake It! that is located in Rocking Range. There is also a secret map hidden in this level. In the beginning of the level, Wario can run over strong streams of water, which can shoot up and down at different heights to make obstacles. Another obstacle is a spotlight that shines around the area. 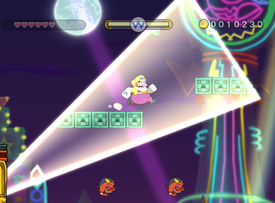 Invisible objects caught in the spotlight (such as platforms for Wario to walk on) will become visible, making it much easier for the player to find their path. At some point, Wario will be in a building with a single slot machine displaying enemies, balls, and bombs. The player must shake the Wii Remote to stop the slot machine. Whatever object stopped on the machine will appear. Wario can either use the object or fight the enemy that appears (depending on what the item is). After overcoming many obstacles, the player will meet the caged Merfle. They must make Wario shake the cage to free him, but afterwards, an alarm will go off. Wario then must run to the end of the level to beat it. The music played in the level is a remix of the theme from Greenhorn Ruins from the game Wario World. This page was last edited on January 16, 2019, at 10:36.